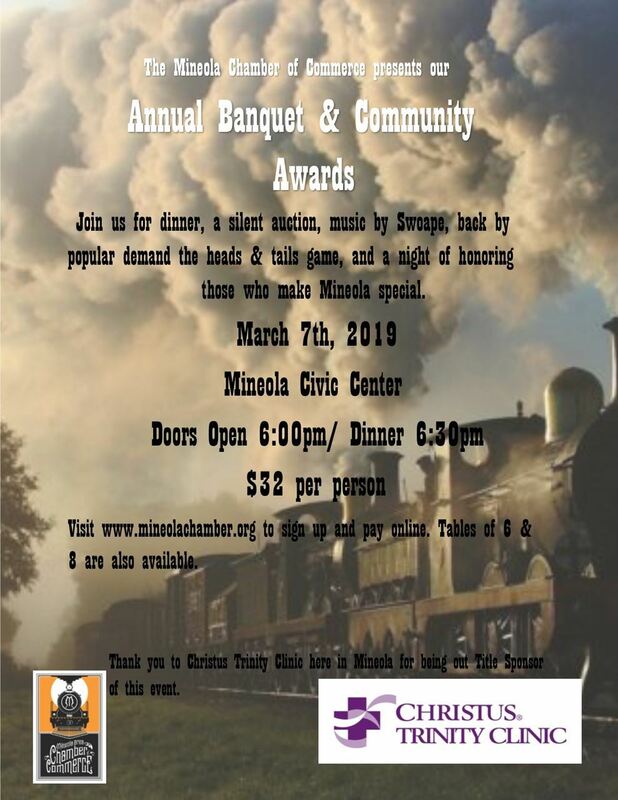 The Mineola Chamber of Commerce is happy to announce our Chamber Community Awards Banquet date of Thursday, March 7th at the Mineola Civic Center. Join us for our annual banquet where organizations honor individuals in our community that have given selflessly for the good of the citizens of Mineola and Wood County. Doors open at 6:00pm and a delicious dinner begins at 6:30pm. Tickets are $32 per person or you can reserve tables for 6 or 8 people. If you prefer to register in person, stop in to the Chamber office and we will register you there. This event sells out each year so make your reservation soon! There will be a silent auction so come when the doors open to see all of our goodies. This event is BYOB and for more information please call the Chamber at 903-569-2087.